Rumi Spice's Emily Miller, along with co-founder KImberly Jung, made Fortune's 2016 list of the most innovative women in food and drink. BACK OF THE YARDS — Kimberly Jung and Emily Miller, U.S. Army veterans and co-founders of Rumi Spice, based out of The Plant, have been named two of 2016’s most innovative women in food and drink by Fortune magazine. The two are ninth on the list of 20, not bad considering the company: high-level execs from Whole Foods and Kroger and director of the Harvard Food Law and Policy Clinic and Boston star chef Barbara Lynch, among them. Jessica Alba, the actress and Honest Company CEO, was on last year’s list, which Fortune compiles with Food & Wine magazine. “It came out of nowhere. It’s been really great,” said Miller, who, like Jung, attended Harvard Business School and moved to Chicago from Boston last year. It’s been a year of expansion for their company, which imports and sells saffron grown in Afghanistan. They added two processing facilities in Herat, and by year’s end, they’ll have hired more than 300 Afghan women, Miller said. They have partnered with meal delivery company Blue Apron and are finalizing another partnership with a Chicago area distributor who will supply Rumi Spice saffron and saffron-based products, including a saffron butter, to restaurants and food service customers. A recent New York Times profile, in which renowned New York chef Daniel Boulud described the saffron’s flavor as “exceptional,” helped boost sales. Potential investors have come calling, Miller said. Last year, Rumi Spice surpassed its production goal of 100 kilos. “Next year, our estimate is 150, but I think we’ll probably be able to bring in 250 to 300 kilos,” Miller said. “The hardest part is you have hundreds of thousands of flowers, and you have to process them in a such a short amount of time,” she said. Saffron threads are the stigmas of the saffron crocus — three per flower, harvested by hand. DNAinfo first wrote about Rumi Spice in October, a week after Miller and Jung moved the company to The Plant — a vertical farm inside an old meat-packing warehouse at 1400 W. 46th St. — and less than a year after their first saffron harvest. Carol Wang, another Rumi co-founder and the company’s legal counsel, hand-carried that first shipment of saffron into the United States. Abdul Shakoor Ehrarri, an agricultural specialist and partner, manages Rumi's operations in Afghanistan, working directly with farmers. The war-torn country is a rich but untapped agricultural asset that produces some of the world’s best saffron, according to Miller. “We’re embarking on tons of new product development, having saffron as the main protagonist in the things we create,” she said. 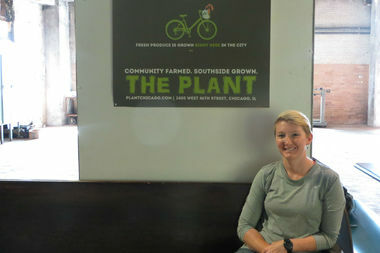 While they expand their retail presence in Chicago and the Midwest, Miller and Jung continue to sell at The Plant’s farmers market, which starts back up, once a month on Saturdays, in October.